These Asian Steak Roll Ups make the perfect appetizer, lunch or snack! They are so versatile! They are low in calories, high in protein and low carb! 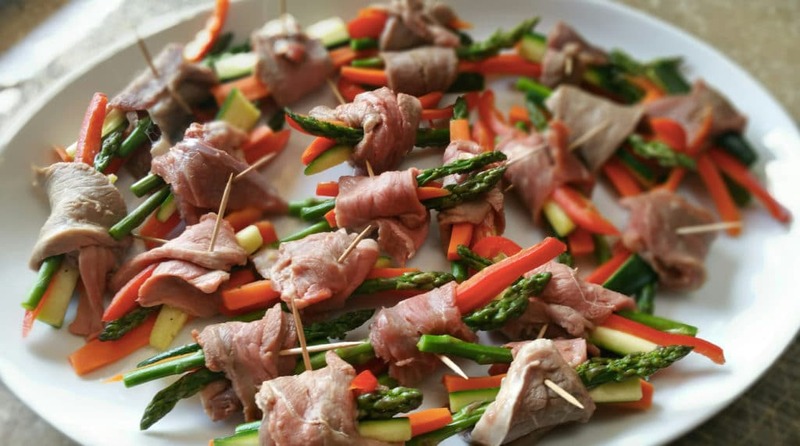 Full of flavor and super healthy, these roll ups are a crowd pleaser!! I don’t know about you but I am always looking for new snacks. I snack all day long…I mean all day long! They are healthy snacks though. I’m that person who eats 5-6 small meals a day. I really can’t call them meals…they really are large snacks! I can’t tell you how important it is to make sure you are eating enough of the right types of foods throughout the day. It’s a key factor to staying healthy and staying full! I always look for snacks that are naturally higher in protein. Most people eat heavier carbs and fat throughout the day, which can lead to weight gain. Having a diet higher in lean protein keeps your body working harder to break the food down. It helps speed up your metabolism. An no, I’m not a diet fan. I don’t believe in the Adkins diet, nor any “diet” for that matter. I believe in eating healthy with lots of lean protein, the right types of carbs, fresh fruits and veggies, and good fats. And this recipe gave me 3 of those…fresh veggies, healthy fats and lean protein! And that’s where this recipe comes in! Ok, so let’s start with the fresh veggies. Ok, yum! How delish do these look?! 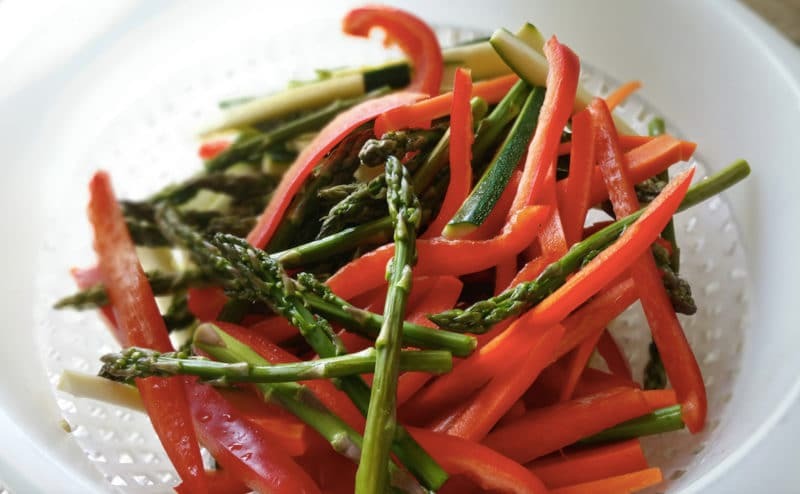 I could eat raw asparagus, red peppers and carrot sticks all day! I love that this appetizer packs in the vegetables. So many fabulous nutrients! Next comes in the lean thin-sliced sirloin. These are so simple to put together guys…you’re going to cut your carrots, asparagus, red peppers and zucchini into thin pieces and saute them in a skillet. Next, you’ll slice your sirloin thinly and let the steak marinate for a bit. After they marinate, you’ll roll up the steak in with the vegetables and then secure with a toothpick. You’re then going to brush your marinade on the steak roll ups and BBQ them on your grill until the meat is at your desired temperature, just a few minutes really. It doesn’t take long at all for thin sliced steak to cook!. Once they are done, you’ll top them with sesame seeds and bam, you are ready to eat! Ya’ll it just does not get any easier than this! 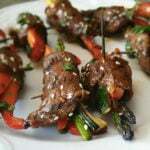 When I eat these Asian Steak Roll Ups, I eat them for a snack, for lunch over rice with a salad OR I serve these as an appetizer! Out of all the recipes on my food blog, these Asian Steak Roll Ups are my husband’s absolute favorite recipe, outside of my Homemade Lasagna. Everytime I make these, my husband always says, “Oh my goodness – these are so delicious!” And indeed, they are! 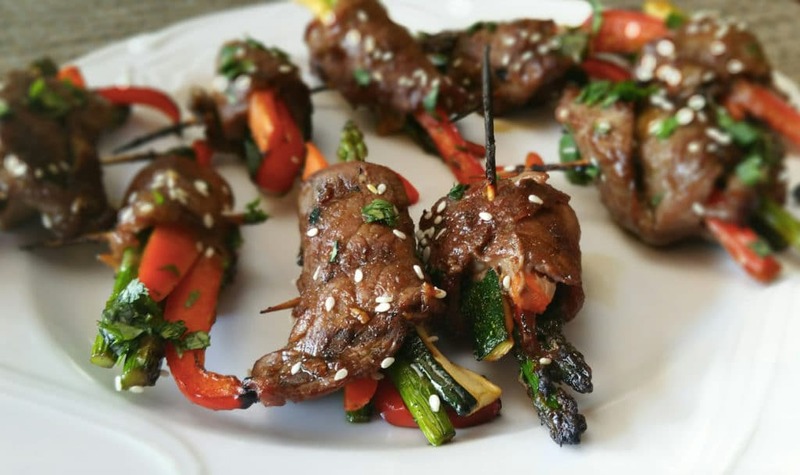 Enjoy these naturally gluten free Asian Steak Roll Ups! In a large bowl, whisk together soy sauce, brown sugar, garlic, ginger, sesame oil; set aside. Take 6 Tablespoons of the marinade mixture out of the big bowl and set into a small separate bowl (you will have 2 bowls of marinade). Heat olive oil in a large skillet over medium high heat. Add the garlic, asparagus, carrots, bell pepper and zucchini. Saute, stirring occasionally, just until crisp-tender, about 3 to 4 minutes; season with salt and pepper, to taste. Set aside. After the meat has marinated, working one at a time, top each beef slice with each vegetable, roll up and secure with a toothpick. In the beef marinade that's left over from the marinating process, liberally brush the mixture onto each of the roll ups. Preheat a gas or charcoal grill to medium heat. Add roll ups to the grill, seam-side down, and cook until browned, about 2-3 minutes per side. After you remove these from the grill, brush the marinade that was not used that was set aside on top of your cooked roll ups. Garnish with cilantro and sesame seeds. Serve immediately. 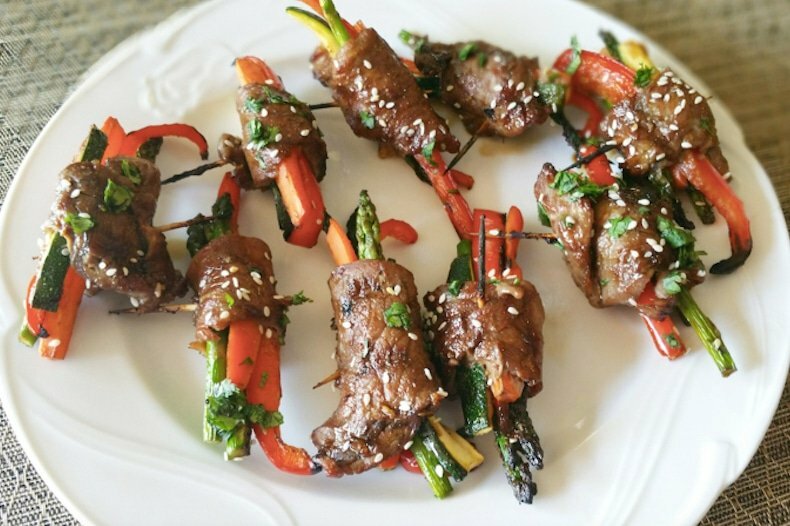 Pin these Asian Steak Roll Ups to your favorite APPETIZER and SNACK boards on PINTEREST! Made them tonight! Delicious and simple! SO glad you loved them! They are easy and delish!! Thanks for your comment! !